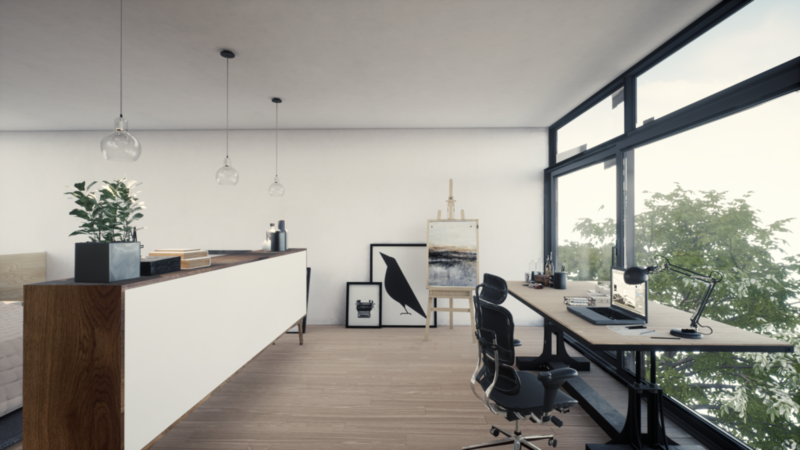 So what’s all this you keep hearing about “real-time visualization” and what does any of it have to do with your job as an architect, CG artist, or real-estate marketeer? Here’s our take on what this emerging trend in the industry is and how it may (and does) affect you. Real-time Interactive applications really aren’t anything new in the realm of architectural visualization. As a matter of fact, various implements of visualizing architectural spaces and forms in 3D have come and gone over the last few decades with varying degrees of success (usually erring on the side of not-very-successful.) The limitations had usually come built to the ubiquitous grey boxes parked quietly in the corners of our desks – the very tools of our trade, the outer boundaries of their performance, and our abilities to use them effectively. In less literary terms, real-time archviz has, historically, failed to live up to their pre-rendered counterparts because of a clear lack of visual quality. This wasn’t necessarily as much a hardware limitation as it was a more practical constraint. 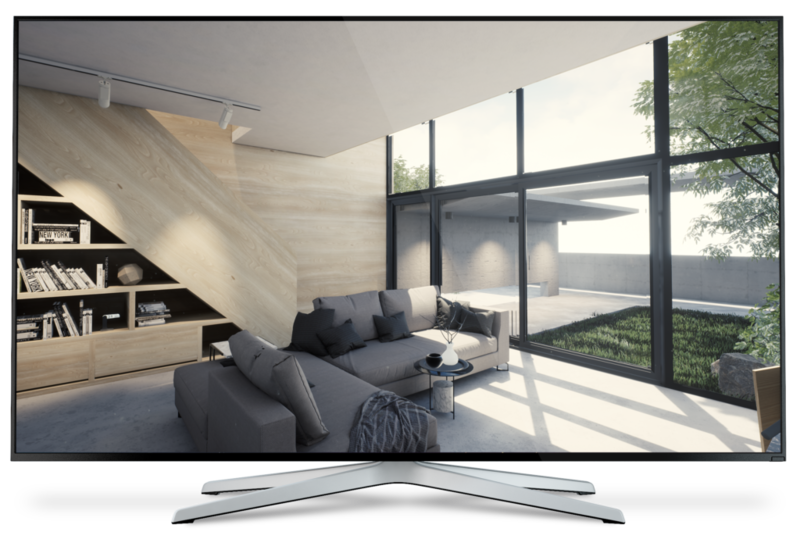 Driving visuals in real-time would often require the investments of hundreds of thousands of dollars in computer hardware just to look around a few rooms with relatively convincing graphical fidelity. Fast-forward to today and any decent computer capable of playing modern video games can do the job reasonably well. Another area that has improved leaps and bounds in recent years has been the software packages used to build these applications. Namely, “game engines”: purpose-driven computer programs intended to build video games. 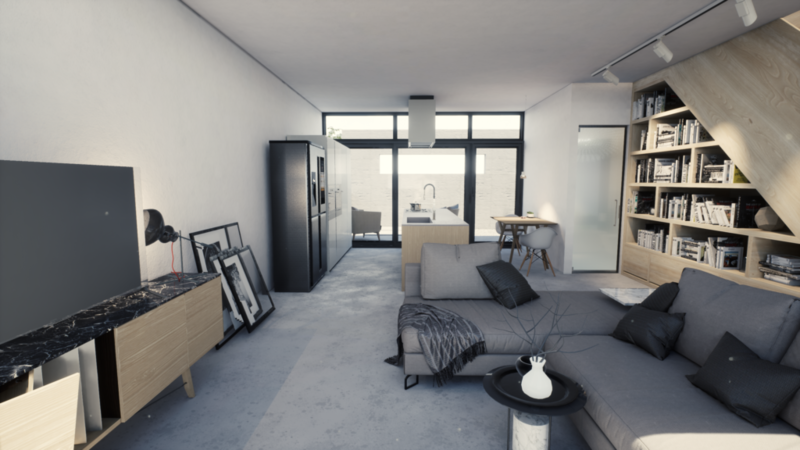 These tools were never particularly easy to use for those traditionally trained in using the more conventional archviz programs, these days, however, the prevalence of doing archviz in realtime using such tools has been a strong force in remolding their utility. Unreal Engine 4 by Epic Games is, among many, one such application. And it is a veritable tour de force of visual quality and performance; asking relatively little of the user in return for the results that it offers. Apart from being completely free to download and use indefinitely, UE4 also offers the utility of it’s Unreal Studio subscription for those that opt into their beta program. Eventually, that bundle will probably cost a pretty penny though but for now it offers some stuff for free – Substance materials, some semblance of support from their sparse dev team, and – most importantly – DataSmith. That last one is key, since it allows you to virtually drag-and-drop your architectural scene directly into Unreal Engine with the utility taking care of the majority of its conversion. While not completely perfect, this utility can help shave hours of [essentially redundant] work from your pipeline, allowing one scene to serve the purpose of still image or animation renders, as well as its real-time implement. Other game engines are catching on to the trend as well – Unity following closest behind with their implementations to ease the workflow as DataSmith has done for UE4 users. Those coming from less UX-centric programs such as 3DS Max or Maya will feel right at home with the user interfaces of UE4 and Unity, but to most others they may feel like a discordant mess at first. While the barrage of features and controls might feel a bit overwhelming and intimidating initially, they’re surprisingly easy to get used to. One thing, however, that I haven’t managed to do still after having used UE4 for almost a year now, is remember which parameter and control is where. I suppose it’s a good thing then that all parts of the interface features a search bar. Now… If only I could remember what the parameter I’m looking for was called. To the untrained eye, it’s difficult to distinguish the difference between an adequate still image render and a screenshot from a real-time project. The caveat, however, is the few limitations of the hardware that still remain. Computers… Umm… compute reflections and refractions (among other things) through a process called ray-tracing. Ray-tracing is a computationally expensive process, requiring exponentially longer times and higher processing power to compute, the higher a visual quality is asked for. Simply put, the most capable of modern day graphics hardware is only able to, at best, “interpolate” such ray-tracing results (i.e. use deep learning algorithms to build a hybrid image closely resembling a ray-traced visual.) Now, you might be wondering why’s that’s an issue? I mean we’ve been doing this with still renders and animations for years, right? Well, yeah, but where those examples would often allocate minutes hours and days to each individual frame, real-time applications ask that you do that around sixty times each second! That being said, the current results are, by any stretch of our expectations, outstanding. Baked lighting resembles traditional global illumination models, meaning that lights bounce around the scene to create convincingly soft shadows and subtle nuances in lighting. Screen-space and precomputed reflection captures do a “good enough” job of mimicking ray-tracing. And post-processing allows an almost cinematic visual experience if it is so desired. There are still a large number of obstacles facing real-time visualization currently, the biggest being the hardware required to drive it. But as it stands, this type of viz product has proved a very capable design simulation tool for architects and interior designers, well past the utility offered previously by stills and animations. The ability to “walk around” your designs, especially when paired with virtual reality, offers a previously unprecedented level of utility. The ability to change around materials on the fly, switch between day and night, turn on or off lights in the scene, and infinitely more functionality can serve to enrich the design experience and elevate visualization as a whole to a new level of utility. Apart from the obvious benefits to the design side of things, real-time viz has found a home in the hearts of marketing professionals as well. Save for the kitschy tendency to label everything with a buzzword like “VR this” and “interactive that”, such visualizations have already proven a far more effective marketing tool than stills and animations in the real-estate industry. As architects and visualization artists, you might all be thinking “well why are we even doing stills and animations anymore?” “Let’s all just jump aboard the real-time bandwagon and do everything there.” And, well, you’d probably be right. Having worked in the visualization industry for over a decade, I know an emerging trend when I see it. And I’m all but certain that real-time visualization will completely replace stills and animations entirely in the years to come. If you’re an aspiring or practicing viz artist and you haven’t started working with game engines, it’s probably best you start looking into it now. This is not to suggest that stills and animations will fade into oblivion altogether. Beautifully rendered (again, no pun intended) examples of architectural scenes, photo-realistic or otherwise, will remain an art form all their own: becoming more the kind of video you play at your building lobby, or the kind of image you print and frame to hang on the wall behind your desk. As with all new media, it will be some time before CG art is given the same regard and provenance as the art forms that came before it, but I see no reason to doubt that the best of archviz will find homes in galleries and museums. Real-time, on the other hand, will reign supreme as the mainstay of visualization-per-see and extend outwards to incorporate additional functionality from building information models, ecological simulation, and much more. Whether you’re an aspiring design viz artist or an industry veteran, if you haven’t already looked into your options for exploring real-time visualization, it’s time to start looking. There are excellent video tutorials available at a cost from site like Udemy, with equally good ones available for free on YouTube, both for UE4 and Unity. Expect a blog post from us soon, outlining the key differences between these two game engines to help you choose the one that’s right for you. Your site has given the best information from your articles they are amazing and useful to all people. Thanks for sharing this post and Impressive site you have thank you all. First Look 3d Studio provide services like 3D perspective Views, 3D front Elevation,3D side elevation,3D Designing & Rendering, 3d walkthrough services, 3D Interior Designing and Rendering, 3D Floor plans, 3D Cut Section,3d landscape designing, 3D walkthrough, walkthrough for interior, 3D VR reality,3D VR walkthrough,3d dron walkthrough and 2D Working drawing for elevation & interiors.